Thank, Dr. Reckner, for your kind introduction. 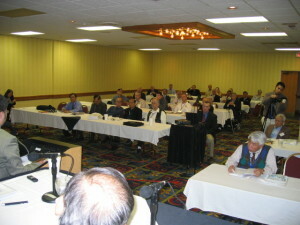 I was here at Lubbock two times (in 2001 Conference and 2002 Symposium). 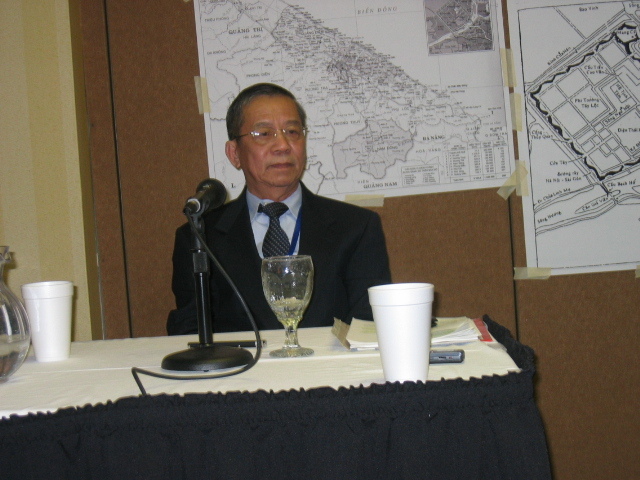 This time, I will talk about the Mau Than Massacre at Hue in 1968. Even right after the Mau Than event, the American mass media ignored the massacre of thousands of innocent people committed by the Communists but portrayed our military victory as a defeat. During the last 40 years, lot of information on this crime has been revealed. But it seems that people don’t care anymore. I am here today to ring the bell to call for this heinous crime not to be erased. We get to do something to keep it remembered and to avoid such act would happen again. Dr. Reckner has just introduced me. So I will skip this slide to save our time. 3.- After the Communists took the South, they sent 500000 South Vietnamese servicemen and women to concentration camps (from 3 to 20 years or more). This included civil servants, priests, businessmen… Tens of thousands died of starvation, illness, torture, execution in prison. 4.- At the same time, there were hundreds of thousands people fled the country to seek to for freedom in other countries. Half of those people vanished on the high sea or in the dense forests. 5.- Today, Thousands of young women have been sold to the neighboring countries. A great number ended up in whorehouse. Tens of thousands have been sold to be some kind of hard labor slaves. Slides 5: In this presentation, I will focus only on the Massacre at Hue. This happened on the Mau Than New Year Eve and the following 4 weeks. To our Vietnamese people, the New Year is the most important holiday of the year. It is the day of family reunion. It is indeed a sacred celebration. People from all over country will come back to their home village. In at least one week, people celebrate the new year, clean and decorating the grave yard and honor the dead. Mr. Trinh Quoc Thien will talk about the battle. I only mention that the Tet Offensive is part of phase 2 of the Winter Spring Campaign of the Communist army. 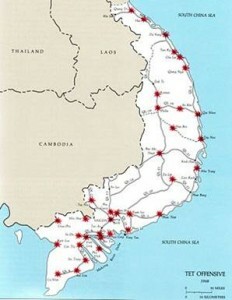 Slide 7: Here is the map of Vietnam during the Tet Offensive. Hue is the old capital of Vietnam, located about 80 kilometers south of the DMZ. Slide 8: Although we did not fight a conventional war, we always respected the truce to cease fight during the holidays as agreed upon by both sides. At the end of the lunar year, the Communists suggested a 7 day cease fire. South Vietnamese government agreed only 3 days since in the past, the Communists did not respect the truce. That’s why, the military authorities allowed a rotation of 50% of the force to go home with family. On the New Year Eve, January 29, 1968, while the residents of Hue people were preparing for the new year celebration, 12000 NVA and VC soldiers left their hideout west of the city, and suddenly attacked the city from 4 directions. 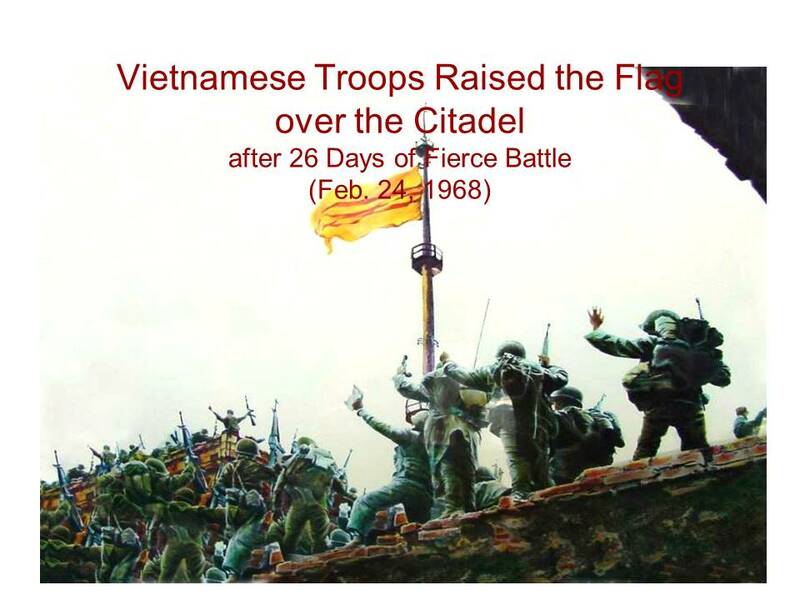 After 4 days of fierce combat, the NVA and Vietcong occupied the city, except for the Headquarters of the 1 Infantry Division, MAC-V Compound, Thua Thien Sector Headquarters, and the Radio Station. The South Vietnamese troops with the support of the US Marines, fought in 24 days to retake the city. On March 2, the last resistance of Vietcong was silenced. Slide 9: Just in Hue battle, there are about 2500 VC and NVA troops killed, another 2500 might be killed as they retreated; 89 were captured. South Vietnam lost 421 soldiers, 2123 wounded and 31 MIA’s. Of 140,000 Hue residents, more than 5800 killed and 116,000 left homeless after the battle. Slide 11: Since Hue was the center of the Buddhist Church and the Anti-Government movements, the Communists could easily infiltrate and recruit their secret cadres. Most of them were college students and professors. These moles helped the NVA to make a list of South Vietnamese soldiers, and civil servants, and arrested and executed them during their occupation. There are some figures that we should not forget: Le Van Hao, the brothers Hoang Phu Ngoc Tuong and Hoang Phu Ngoc Phan, Nguyen Dac Xuan, Nguyen Dinh Chi, Nguyen Doa… They had been professors or students of Hue University who turned to be executioners in this horrible event. Slide 12: Not only South Vietnamese soldiers and civil servants and low ranking cadres, victims of Viet Cong Massacre includes students, professors, High school teachers, Catholic priests, Buddhist monks, young men at the age of military draft, foreign doctors, and foreigners who worked for humanitarian organizations, and American contractors; and even ordinary people, young women and children. The North Vietnamese Communists assumed their victims as those who had blood debt to the Revolution, collaborators with Americans. To those who did not have any contact with South Government, the communists considered them as “having bad attitude towards Viet Cong. During the NVA withdrawal from Huế the NVA summarily executed anyone in their custody who resisted being taken out of the city or who was too old, too young, or too frail to make the journey to the camp. (Manhard, a U.S. Senior Adviser who was taken to a POW camp by the North Vietnamese Army (NVA) and held until 1973. The planned execution of government officials and their families, political and civil servants, and collaborators with Americans; and those civilians not connected to the government who ran from questioning, spoke harshly about the occupation, or the occupiers believed “displayed a bad attitude” towards the occupiers (Don Oberdorfer and Paul Vogle, an American English professor at the local Huế University by interviewing witnesses of the North Vietnamese and Viet Cong occupation.) Oberdorfer reported that in the Catholic area of Huế, Phucam, virtually every able bodied man over the age of 15 who took refuge in the cathedral was taken away and killed. Slide 14: On the very first day in Hue, the NVA and Viet Cong established the People’s Committee with the involvement of the local pro-communist members. They began to call the South Vietnamese soldiers and agents to report to the committee. These people were released with promise of safety. Viet Cong did this 2 or three more times to get more people reported. Finally, when they think there would be no more people in hiding. They kept their victims and began the slaughter. Slide 15: In some first mass graves within the city, we found that people were tied back to back in every 2 using the electric wires, or telephone cables even with barbed wires. They were buried alive. Some had their head blown or shot in the head. The group of more than 400 people taken from a Catholic church was ties in bundles of 20. They were led to the forest 20 kilometers west of Hue and were killed with all types of guns and grenades. Some groups were ordered to stand on land mines, and the Communists simply ignited. Slide 16: To this day, we don’t know exactly how many people were killed. The number is estimated 7600. Of them about 5800 confirmed dead. There are 1173 killed due to accident of the battle. There are 1800-1900 missing still unaccounted. Ø Bodies found at Phu Thu Salt Flat, November, 1969 (est.) : 300 – 1000? Slide 17: To the Communists, whoever didn’t support them would be considered reactionary elements and thus, their enemies. At the Paris talks, Viet Cong delegation denied that it had not been the work of Communists but of “dissident local political parties“. Broadcasting on Hanoi’s Liberation Radio (April 26, 1968), North Communists said “Victims were only “hooligan lackeys who had incurred blood debts of the Hue compatriots and who were annihilated by the Southern armed forces and people in early Spring.” Ex-Colonel Bui Tin recently stated that the Viet Cong tried to get rid of people as they retreated from the battle. Others believe that when the Communists could not hold the city, they wanted to eliminate the witnesses. Revenge killing in the name of the Communist party or settle old scores. Minute (A French Weekly Magazine): Article by Yves Gautron stated that no one on this planet could forgive the heinous act of killing people by Communist troops. Of 354 U.S. news reporters in Vietnam, only 40 reported the battle but did not mention the massacre. Even they distorted the information to make the 68 Offensive a defeat of our troops. This reflected the bias of the media during the rise of the anti-war movement in the U.S. They tend to favor the public as said by NBC producer Robert Norshield: “The public perceived it as a defeat, and therefore it was a defeat “ Robert Northshield, NBC’s executive producer. Please, compare the Mau Than and My Lai massacres to see how we have suffered from the bias US media. Slide 23: VC casualties: 85,000 during the Winter-Spring Campaign (killed or permanently disabled). In Hue: 2500 killed during battle. Estimated 2500 killed while retreating beyond Hue. After Tet Mau Than: VC Infrastructure in South Vietnam was almost totally destroyed. Many Communist sympathizers switched their side. Pro-Communists became pro-government. Slide 24: Almost every family in Hue has at least one relative, close or remote, who was killed or still missing. Exhumed bodies showed teenagers and women as victims of this horrible massacre. A great number of pre-68 anti-war activists, pro-communists people took side with South Vietnamese government. After April 30, 1975 when South Vietnam fell into the hand of the Communist Party, it seems that the number of boat people of Hue origin takes up a greater proportion among the refugees than that from the other areas. Slide 39: After taking Hue in 1975, the Communists tried to move the Hue residents to the remote New Economic Villages, and filled the empty houses with their people from Northern provinces. For years, Hue still mourns their relatives who were victims of the massacre. They mingle the massacre with the New Year celebration to cheat the Communist authorities. Assuming more than 50% of population had been born after the War who know nothing about the massacre, Communists celebrated Mau Than Offensive as their victory, distorted the true history, indifferent to the misery of their people. This year, to mark the 40th anniversary of the Mau Than Offensive, the Communists celebrated it as their victory; disregard the misery of their people. Slide 40: Of course, many of you already know about the Mau Than Massacre. You may know more than I do. But I still think it is not enough if we do not bring this issue in to light to make everyone on earth know it. The killers still own Hue the blood debt. They must be brought to the justice. They might be dead or still alive, still in the VCP Poli-bureau, Central Committee and some where in Vietnam. They got to pay.